A cruise aboard the R/V CORLISS during August and September, 1997, collected 670 km of sidescan-sonar imagery on the inner continental shelf between Tillamook Head, OR and Point Grenville, WA. On a second cruise in 1998, sediment samples were obtained at 95 stations to verify the sidescan-sonar imagery (Fig. 1). The sidescan-sonar data were collected along a grid of tracklines spaced approximately 5 km apart and were used to provide a reconnaissance overview of the surficial geology of the inner shelf. 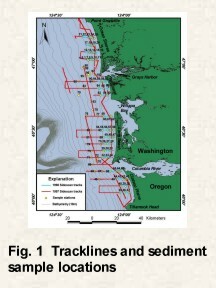 These data define the extent and lithology of shelf sediments associated with the Columbia River littoral cell as part of a study of the erosion of the Washington coast that is being coordinated by the U.S. Geological Survey and the Washington State Department of Ecology (Gelfenbaum et al., 1999). Seismic-reflection profiles were obtained in concert with the sidescan-sonar data, and are discussed by Cross et al., (1998). 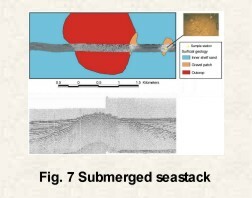 This report presents a discussion and summary interpretive map based on the integration of the sidescan-sonar, seismic-reflection (Cross et al., 1998), and sample data collected aboard the Corliss with existing sediment sample data (Roberts, 1974; Nittrouer, 1978; Smith et al., 1980). The mapped sidescan-sonar imagery without an interpretation and the sediment sample analyses are also included on this CD-ROM. The northern Oregon and southern Washington continental margin is tectonically active (Atwater, 1992; McCrory, 1996), is subjected to heavy storm waves (Komar, 1997), and, through the Holocene, has received a huge amount of sediment from the Columbia River (Nittrouer, 1978, Sternberg, 1986). In the study, the near-surface stratigraphy of the shelf is characterized by three units. The oldest unit is Tertiary strata which are mostly marine sand and siltstones and have been intensely folded and faulted in response to the tectonic forces of this margin (Wagner et al., 1986; Snavley and Wells, 1996). Seismic data suggest that north of Grays Harbor some of these deformed strata are exposed on the sea floor (Wolf et al., 1997; Cross et al., 1998), and some of the on-land faults appear to have been active during the Quaternary (McCrory, 1996). The intermediate-aged unit is a well-rounded gravel, interpreted to be of glacial origin (Venkatarathnam and McManus, 1973) that partially buries the Tertiary strata. These deposits are exposed on the sea floor and have been sampled on the inner shelf north of Grays Harbor as well as in localized patches along the shelf edge (Venkatarathnam and McManus, 1973; Roberts, 1974; Nittrouer, 1978). The composition of the gravel suggests it is associated with outwash deposits derived from glaciers on the Olympic peninsula (Venkatarathnam and McManus, 1973). The youngest deposit is Holocene in age. It covers much of the middle shelf between Tillamook Head and Point Grenville, and the inner shelf south of the Grays Harbor area. This modern deposit is as much as 50 m thick, and its surface consists of silty sand on the middle and outer shelf and fine sand on the inner shelf and lower beach face (Nittrouer, 1978; Sternberg, 1986). The finer-grained part of the deposit on the middle and outer shelf has been referred to as a mid-shelf silt deposit by Nittrouer (1978) and Sternberg (1986), but the large sand component of surface sediment samples show that it actually is a sandy silt. Mineralogical studies of beach (Ballard, 1964) and shelf sands (White, 1967) indicate that these sediments are primarily derived from the Columbia River. Sidescan-sonar imagery was collected using an EdgeTech DF-1000 sidescan-sonar system and logged with a Triton Elics Isis data logging system. The digital sidescan-sonar data were processed and mapped to provide proper geographic locations of features identified in the imagery. The processing steps included subsampling the raw sidescan-sonar data using a median filtering routine to suppress speckle noise (Malinverno et al., 1990), and correct for slant-range distortion, signal attenuation, and dropped sidescan-sonar lines (Danforth et al., 1991). After these processing steps, the imagery was placed in its proper geographic location using techniques summarized by Paskevich (1996). Final image resolution was 2 m/pixel. The sidescan-sonar images were then exported from the remote sensing software package PCI as TIFF images with associated world files for georeferencing. These images could then be incorporated into the ArcView GIS and evaluated with the other data in the study area. 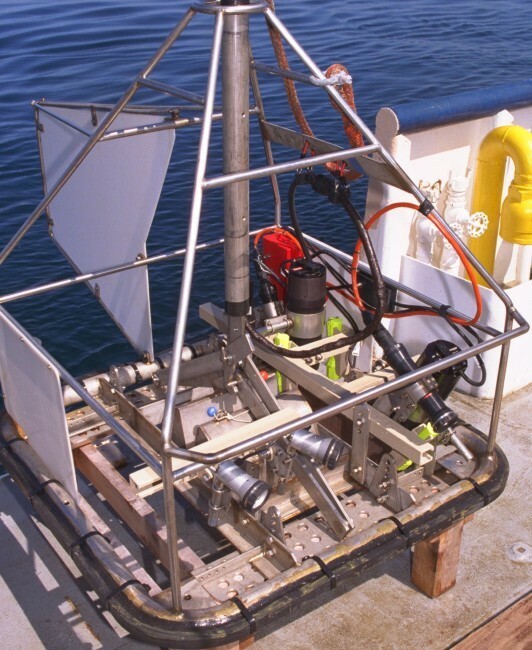 Sediment samples were attempted at 100 stations and recovered from 95 stations. Sample locations are shown in Figure 1, and the results are summarized in Table 1. Samples were collected with a Van Veen grab sampler in a frame which also held a video camera and a 35-mm Benthos camera. Most stations have bottom photographs and video accompanying the sample information. Sample sites were located by either differential GPS or P-Code GPS receivers. In the laboratory, samples were washed to remove the salt and then were sieved using a 4 phi (62.5 micron) sieve to separate the silt and clay (fine) fraction from the sand and gravel (coarse) fraction. The fine fraction was analyzed by Coulter counter (Shideler, 1976). The coarse fraction between 4 phi (62.5 microns) and 3 phi (8 mm) was sieved at ¼ phi intervals, and the results are presented in Table 2 as percentages by weight. Size classifications are based on the method proposed by Wentworth (1929) with the phi nomenclature proposed by Krumbein (1934). The classification scheme for sediment type follows Shepard (1954). A detailed description of the laboratory procedures is given by Poppe et al., (1985). 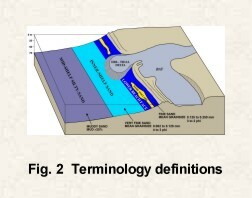 Because this study focuses on the transition between the beach and the shelf, an area where a variety of terms have been used, the terminology used in this report is defined to reduce confusion (Fig. 2). The shoreward edge of the study area is on the lower beach face, and the study extends across the inner shelf to the middle shelf. The transitions between the beach, inner shelf, and middle shelf are based on facies changes. The lower beach face is defined as the submerged part of the beach face where the mean grain size of surface samples is coarser than 3 phi (fine sand, 125 microns). The inner shelf is immediately seaward of the lower beach face and coincides with places where the mean grain size is finer than 3 phi (125 microns) and the mud content is less than 25 %. The middle shelf is where the mud content exceeds 25%. The transition from lower beach face to inner shelf normally is in 15-25 m water depths, and the transition from inner to middle shelf is in approximately 55 m water depth. The sidescan-sonar data in combination with the seismic-reflection data (Cross et al., 1998), historical sediment samples (Roberts, 1974; Nittrouer, 1978), new surface sediment samples (Table 1), and some bottom photographs show eight distinctive sedimentary units in the study area (Fig. 3). Two of these units are pre-Holocene in age, whereas the other six are all modern subunits. The oldest unit, identified as "outcrop" in Figure 4, includes all types of pre-Quaternary strata exposed on the sea floor. 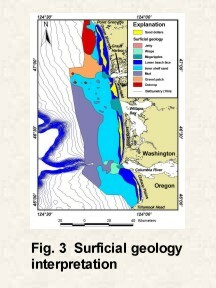 This unit includes Eocene aged volcanic rocks which continue offshore from Tillamook Head (Fig. 5; Walker and McLeod, 1991), folded Tertiary marine strata between Copalis and Point Grenville (Fig. 6), and inferred submerged sea stacks off Grayland and Grays Harbor (Fig. 7). Photographs could not be taken of these outcrop areas because the combination of poor bottom visibility and large swells would have resulted in damage to the sampler. As a result, interpretations are based on the sidescan-sonar imagery and seismic data alone.Since the primary objective of this report was to map the distribution of recent sediment associated with the Columbia River littoral cell, we did not differentiate these older rock types. The distribution of outcrops of the older strata is of interest, however, because they mark the edge of the modern shelf deposit. Although seismic data show these units underlying the Holocene shelf deposit throughout the area (Cross et al., 1998), they crop out only at the two ends of the study area immediately offshore of Tillamook Head (at the southern end) and over a large part of shelf north of Grays Harbor (Fig. 3). Patches of gravel appear on the sidescan-sonar image either as areas of uniform high backscatter (Figs. 7, 8) or as areas with alternating bands of high and moderate backscatter (Fig. 9). The alternating bands of high and moderate backscatter have a 2-4 m spacing, trend roughly parallel to the shoreline, and represent megaripples presumably generated by oscillatory wave currents. These patches have abrupt boundaries with the surrounding finer-grained sediments and, in some cases, the seismic profiles show that the gravel covers the floors of shallow depressions (Fig. 8A). Where crossed, the gravel patches are linear and trend roughly NE-SW. They appear to be similar to the rippled-scour depressions seen on many other continental shelves (Cacchione et al., 1984; Schwab et al., 1997 ). Grain-size analyses show that these gravel patches contain well-rounded pebbles that are mostly 2 mm to 2 cm in diameter (Table 2 sample numbers 94, 95, 99), and bottom photographs show that they are mostly free of shell debris (Fig. 8B). 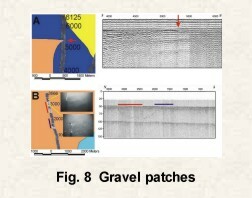 The sidescan-sonar images, along with locations of historical samples containing gravel, allow drawing a generalized distribution of gravel patches (Fig. 3). Within the study area, gravel patches are restricted to the area north of Willapa Bay and are most abundant around the areas of outcrop. Outside of the study area, gravel also was sampled along the shelf edge seaward of the modern shelf deposit (Roberts, 1974; Venkatarathnam and McManus, 1973). Six different facies are associated with the modern sediments that cover much of the study area (Fig. 3). Three of these units are identified by textural differences, two by bedforms, and one is of biological origin. These units include: (1) lower beach-face sand, (2) inner-shelf sand, (3) mid-shelf silty-sand, (4) megaripples, (5) wisps of coarse sand, and (6) fields of sand dollars. The deposits associated with jetties are anthropogenic and are not included in this discussion. The three textural divisions of this modern deposit all have the same moderate backscatter appearance on the sidescan-sonar imagery (Fig. 10). However, the surface sediment samples reveal two textural boundaries which have allowed differentiating these three units. The first is the lower beach-face sand that occurs along the shoreward edge of the study area (Fig. 3). The seaward boundary of this unit is arbitrarily picked as the point where the mean grain size becomes finer than 3 phi (125 microns). For much of the study area, this transition occurs in 15-25 m water depth. Lower beach-face sediment is coarser nearshore than it is at its seaward edge. This change is largely controlled by changes in the amounts of fine and very-fine sand. The fine-sand fraction (2-3 phi, 125-250 micron, size interval) decreases from 60-90% in samples taken from depths shallower than 10 m to 40-65% in samples in 20-25 m depth (Figs. 10, 11). In this same depth interval the very-fine sand fraction (3-4 phi, 62-125 micron size interval) increases from 7-35% in water shallower than 10 m to 30-52% in 20-25 m water depth. Bottom photographs show most of the lower beach face is covered by oscillatory ripples with approximately 20-cm wavelengths (Fig. 12). Most of the photographs in water depths less than about 8 m are of poor quality, although they suggest the sea floor is covered by oscillatory ripples or contain a plane bed in some places. Farther offshore, the bottom photographs consistently show oscillatory ripples. The sand-dollar unit, which will be discussed later, is present in 7-18 m depths, and sediment samples from the sand-dollar fields are texturally similar to the samples (without the biogenic component) on either side of this zone. The second textural division of the modern shelf deposit is the inner-shelf sand unit (Fig. 3). This unit extends from the seaward edge of the lower beach face across the shelf to the point where the mud content exceeds 25%. The sidescan-sonar imagery shows that this region has a smooth, moderate backscatter signature with no evidence of large bedforms, although bottom photographs show ripples which are below the resolution of the sidescan-sonar system (Fig 12). The inner-shelf sand has a mean grain size finer than 3 phi (125 microns), and the fine sand fraction decreases gradually from 40-65% in 20-25 m water depth to 5-10% in 55-70 m, while the very-fine sand fraction increases from 30-52% to 55-70% in this same depth interval (Fig. 11). The mud content gradually increases from about 7% in 25 m to as much as 39% in 70 m. The seaward edge of the inner-shelf sand is a gradational facies boundary with the mid-shelf silty-sand deposit. 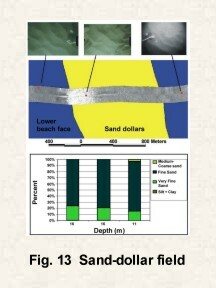 Bottom photographs show that the surface of the inner-shelf sand unit is rippled as well, but that the biological reworking of the seafloor increases with increasing water depth (Fig 12). The third textural division of the modern shelf deposit is the mid-shelf silty-sand region that fringes much of the seaward edge of the study area (Fig. 3). Previous studies have mapped the extent of this fine-grained deposit on the basis of modal grain size (Nittrouer, 1978, Sternberg, 1986) or mean grain size (Gross et al., 1967). Here, the shoreward edge of the silty-sand facies has arbitrarily been set at 25% mud (silt plus clay), but it is important to emphasize that the transition is gradual rather than abrupt (Fig. 10). Samples collected by Roberts (1974) and Nittrouer (1978) were also used to map the mid-shelf silty-sand deposit. Three subunits are superimposed on this general textural trend of the modern shelf. These include two types of bedforms found off the mouths of the three bays, and one unit of biological origin (sand-dollar unit) which is included with the lower beach-face sand unit. The sand-dollar unit appears on the sidescan-sonar imagery as a band of high-backscatter, and bottom photographs show abundant sand dollars in this band (Figs. 12, 13). Usually, it has uniform high-backscatter, although, at times, it has a granular appearance. Bedforms have not been observed in the sidescan-sonar imagery from this unit, although bottom photographs show ripples similar to those present on the adjacent lower beach face (Fig. 13). The seaward edge of the sand-dollar unit is usually extremely abrupt, while the shoreward edge is more gradational. Interestingly, this unit has a higher backscatter signature on the lines running perpendicular to the shoreline versus those trending parallel to the shoreline. This difference apparently is due to the orientation of the sand dollars. The sand dollars stand on edge and are oriented perpendicular to the crests of the oscillatory ripples which are roughly parallel the shoreline. The sand dollars appear to provide a stronger acoustic signature when their faces are insonified (track lines perpendicular to the shore) than when their edges are insonified (track lines parallel to shore). Surface sediment samples show that this unit is texturally similar to the adjacent lower beach-face unit (Fig. 13). The bedforms that can be identified on the sidescan-sonar imagery occur off the mouths of the three bays (Fig. 3). Megaripples were found on the ebb-tidal shoals at the mouths of all three bays. They have 2-4 m wavelengths and crest lines oriented roughly parallel with the bathymetric contours (Fig. 14). Because of their proximity to the bay mouths, they are inferred to be tidally generated. 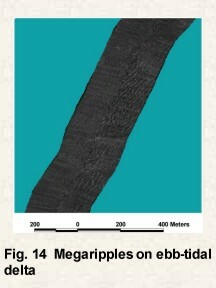 Off the mouth of the Columbia River, seaward of the field of megaripples, the sidescan-sonar imagery shows an area containing bands of moderate backscatter superimposed on a background of low backscatter (Fig.15). These moderate backscatter wisps have gradational boundaries, and the limited data suggests that they radiate from the mouth of the estuary. Two sediment samples from this area recovered medium sand that suggests that these features consist of coarser sand. These wisps could either represent areas of coarse fluvially derived sand that is being spread across the finer-grained shelf facies or areas where older coarser-grained ebb tidal delta deposits have not been buried by finer-grained shelf deposits. The sidescan-sonar imagery and surface sediment samples have been used to map the surficial geology of this storm-dominated inner-shelf environment. 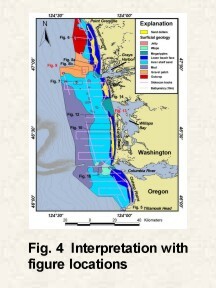 Seismic data have shown that the inner shelf north of Grays Harbor has a thin, discontinuous Holocene cover while south of the mouth of Willapa Bay the inner shelf has a thick Holocene cover (Wolf et al., 1997; Cross et al., 1998). The sidescan-sonar images show that gravel patches and outcrops are present only where the Holocene deposit is thin. 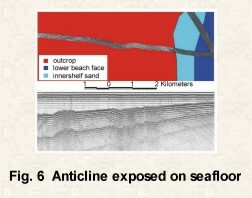 This study has refined the boundary between modern and relict sediments on the inner shelf, shows that different bedforms are present on the relict shelf surface than on the surface of the modern shelf deposit, and reveals that the facies transition from lower beach face to the inner shelf is gradational. Parts of the beaches along the Washington and Oregon coasts lie shoreward of a modern shelf deposit and other parts lie shoreward of a relict shelf surface. The distribution of different shelf sediment types provides a better understanding of the role of the shelf as a source or sink of sediments for the adjacent beach system. The inner shelf seaward of the beaches associated with the Columbia River littoral cell contains three distinctive sedimentary facies. North of Grays Harbor patches of glacial gravel and outcrops of Tertiary rocks are abundant (Fig. 3). The exposure of these older sediments and rocks on the sea floor suggests that this area is a relict shelf surface with only a thin discontinuous veneer of Holocene-aged sediment. The inner shelf off the Grayland Plains has some exposures of Tertiary rocks and a smaller number of patches of gravel (Fig. 3). Moreover, sediment samples showed an increased abundance of patches of mud in this area. Seismic data from the inner shelf ( Cross et al., 1998) suggest that, in this area, the Holocene sediment cover is too thin to be resolved by the seismic system that was used. 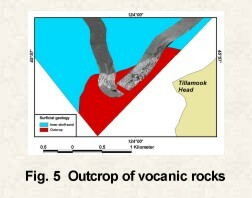 South of the mouth of Willapa Bay, no gravel was sampled on the inner shelf by this study or in previous studies (Roberts, 1974; Nittrouer; 1978; Smith et al., 1980), and there are no outcrops of Tertiary rocks (Fig. 3). These different inner-shelf sedimentary facies are a function of the thickness of the Holocene deposit that covers the inner shelf. Seismic-reflection profiles show what is inferred to be a Holocene deposit on the inner shelf and lower beach face that is between 10 and 50 m thick in the southern part of the study area (Twichell et al., 1999). This deposit thins to the north and pinches out off the mouth of Willapa Bay. Drill holes on the beaches and barriers penetrated 10-40 m of Holocene-aged beach and shelf sand on Long Beach and Clatsop Plains while under the beaches north of Willapa Bay mouth these sandy deposits were only 2-8 m thick (Herb, 1999). South of the mouth of Willapa Bay, the relict shelf surface has been completely buried by a thick blanket of fine to very-fine Holocene sand, whereas, to the north, the sand cover is thinner and exposures of the older sediments on the seafloor are present. In effect, the shelf surface north of Willapa Bay is starved of modern sediments, while, to the south of the mouth of this bay, it is not. 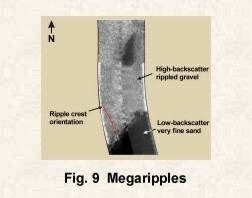 The gravel patches that were imaged by sidescan sonar appear to be similar to ripple-scour depressions that have been mapped on several other relict shelf settings (Cacchione, 1984; Schwab, 1997). Here, these patches have an E-W to NE-SW orientation, have rippled floors, occur in slight depressions, and often have an abrupt facies transition on their northern sides and a more gradational one on their southern sides (Figs. 8, 9). These gravel patches only occur where the Holocene sand cover is less than 1-2 m thick and are completely absent where it is thicker. This relationship suggests that variable sediment types are necessary for the formation and/or preservation of these features. It also suggests that these rippled-scour depressions may be valuable markers of relict shelf surfaces both in other modern shelf environments as well as in the stratigraphic record. In contrast to the inner shelf, the lower beach face is more uniform. 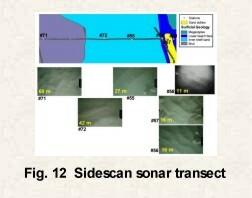 The sidescan-sonar images show it to be acoustically uniform along its entire length and to have no perceptible difference with the adjacent inner-shelf surface (Fig. 12). Surface sediment samples show that the lower beach face south of Grays Harbor fines in the offshore direction from a mean grain size of 2.5-2.8 phi in water depths less than 15 m to 2.8-3 phi in water depths of 25 m. Although the mean grain size suggests that the lower beach face is texturally uniform, distribution between the different size fractions is not uniform along the entire length of the littoral cell. Medium to coarse sand, for example, is present on the lower beach face north of the mouth of Willapa Bay while it is absent to the south (Fig. 16). Sand dollars cause a high-backscatter band on the surface of the lower beach-face facies (Figs. 3, 13). 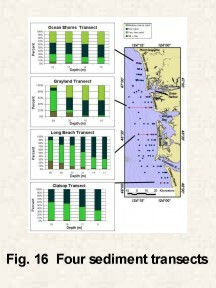 However, transects of grab samples across the sand dollar fields show a uniform textural progression from shoreward of the sand dollars to seaward of them (Figs. 10, 13). The uniform nature of the seafloor sediments suggests that the presence of sand dollars is controlled by the overlying oceanographic setting rather than by the underlying geology. The sediment samples and sidescan-sonar imagery show that, within the Holocene deposit, the transitions from the lower beach face to the inner shelf and from the inner shelf to the middle shelf are gradual (Fig. 11). The gradual transition between the lower beach face and the shelf suggests that the two provinces are part of the same sedimentary system. Whether the inner shelf is a source of sediment for the beach or a sink for sediment lost from the beach had been unclear. However the surface sediment samples from this study suggest that the latter possibly may be the case. Sediment samples collected on the beach show the median grain size is 125-225 microns along the entire length of this littoral cell except for some gravel on the beaches of Grayland and Ocean Shores (Ruggiero et al., 1999). 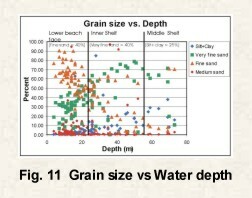 By contrast, the median grain size of the inner-shelf sands is consistently finer than 125 microns (very-fine sand). More specifically, Figure 16 shows the progression in grain size distribution on four transects across the shelf. In all four cases, the coarser than very-fine sand fraction is 71-93% of the samples in water depths of 7-13 m while it decreases to 28-57% in water depths of 24-26 m and is only 5-11% of samples in 50-58 m depths. If the shelf were a major source of sediment for the beaches, a substantial volume of very-fine sand and mud would have to be winnowed from the shelf to provide sediment of the proper texture for the beaches. Moreover, if the shelf were a significant source of sand to the beaches, it seems surprising that there is such a thick accumulation of Holocene sediment on the shelf. We appreciate the expertise that Captains Dan OHagan and George Maddox of the R/V Corliss. Their ship-handling capabilities and knowledge of the study area made for a more successful field program than otherwise would have been possible. Chief Ron Swatfigure and Captain Don Gatlin of the Washington State Department of Fish and Wildlife and George Kaminsky of the Washington State Department of Ecology facilitated the contract for use of the Corliss. Mr. Lewis, Mr. Pederson, Mr. White and Mr. Johnson who were commanders of the Grays Harbor and Cape Disappointment Coast Guard bases are acknowledged for generously offering the use of their docks and facilities during the field programs. Curt Peterson from Portland State University and several of his students and colleagues participated in both field programs and participated in numerous lively discussions on the interpretation of the data. Scott Harrison (Seafloor Surveys International, Seattle, WA) also participated in the 1997 field season. A special thanks to Bev Maddox who participated as a volunteer during the 1998 cruise helping with sample collection and providing a wonderful set of photographs to document the field operations. One other person who can't go without mention is Valerie Paskevich. Several of the metadata files, ArcView shapefiles, and directions on how to use the various datasets were modeled after several of her open-file publications. Helpful reviews by Harley Knebel (USGS), Jane Denny (USGS), and David Percy (Portland State Univ.) greatly improved this publication. Atwater, B.F., 1992, Geologic evidence for earthquakes during the past 2000 years along the Copalis River, southern coastal Washington: Journal of Geophysical Research, v. 97, p. 1901-1919. Ballard, R.L., 1964, Distribution of beach sediment near the Columbia River: University of Washington, Department of Oceanography, Technical Report No. 98, 82 p.
Cacchione, D.A., Drake, D.D., Grant, W.D., and Tate, G.B., 1984, Rippled scour depressions on the inner continental shelf off Central California: Journal of Sedimentary Petrology, v. 54, p. 1280-1291. Cross, V. A., Twichell, D. C., Parolski, K. F., and Harrison, S. E., 1998, Archive of boomer seismic-reflection data collected aboard RV CORLISS cruise CRLS97007 off northern Oregon and southern Washington inner Continental Shelf: U.S. Geological Survey Open-File Report 98-351, 2 CD-ROM set. Danforth, W.W., OBrien, T.F., and Schwab, W.C., 1991, USGS image processing system: near real-time mosaicking of high-resolution sidescan-sonar data: Sea Technology, Jan., 1991, p. 54-59. Gelfenbaum, G., Sherwood, C.R., Peterson, C.D., Kaminsky, G.M., Buijsman, M., Twichell, D.C., Ruggiero, P., Gibbs, A.E., and Reed, C., 1999, The Columbia River littoral cell: A sediment budget overview: Coastal Sediments 1999: Proceedings of the Conference, p. 1660-1675. Gross, M.G., McManus, D.A., and Ling, H.Y., 1967, Continental shelf sediment, northwestern United States: Journal of Sedimentary Petrology, v. 37, p. 790-795. Herb, A., 1999, Holocene stratigraphy and sediment volumes for the Columbia River littoral cell, Pacific Northwest, USA: MSc. Thesis, Geology Department, Portland State University, Portland, OR., 184 pp. Komar, P. D., 1997, The Pacific Northwest Coast: Living with the Shores of Oregon and Washington, Duke University Press, Durham, NC., 195 p.
Krumbein, W.C., 1934, Size frequency distributions of sediments: Journal of Sedimentary Petrology, v. 4, p. 65-77. Malinverno, A., Edwards, M.H., and Ryan, W.B.F., 1990, Processing of SeaMARC swath sonar data: Institute of Electrical and Electronic Engineers Journal of Oceanic Engineering, v. 15, p. 14-23. McCrory, P.A., 1996, Tectonic model explaining divergent contraction directions along the Cascadia subduction margin, Washington: Geology, v. 24, p. 929-932. Nittrouer, C. A., 1978, The process of detrital sediment accumulation in a continental shelf environment: an examination of the Washington shelf: Thesis, University of Washington, Seattle, WA., 243 pp. Paskevich, V. F., 1996, MAPIT: An improved method for mapping digital sidescan sonar data using the Woods Hole Image Processing System (WHIPS) software: U.S. Geological Survey Open-File Report 96-281, 73 pp. Poppe, L.J., Eliason, A.H., and Fredericks, J.J., 1985, APSAS; An Automated Particle Size Analysis System: U.S. Geological Survey Circular 963, 77 pp. Roberts, R. W., 1974, Marine sedimentological data of the Washington continental shelf: University of Washington, Department of Oceanography Special Report 57, 129 pp. Ruggiero, P., Cote, J, Kaminsky, G., and Gelfenbaum, G, 1999, Scales of variability along the Columbia River littoral cell: Coastal Sediments 99: Proceedings of the Conference, p.1692-1707. Schwab, W.C., Allison, M.A., Corso, W., Lotto, L.L., Butman, B., Buchholtz ten Brink, M., Denny, J.F., Danforth, W.W., and Foster, D.S., 1997, Initial results of high-resolution sea-floor mapping offshore of the New York-New Jersey metropolitan area using sidescan sonar: Northeastern Geology and Environmental Sciences, v. 19, p. 243-262. Shepard, F.P., 1954, Nomenclature based on sand-silt-clay ratios: Journal of Sedimentary Petrology, v. 24, p.151-158. Shideler, G.L., 1976, A comparison of electronic particle counting and pipette techniques in routine mud analysis: Journal of Sedimentary Petrology, v. 46, p. 1017-1025. Smith, J. M., Messmer, L. W., Phipps, J. B., Samuelson, D. F., and Schermer, E. D., 1980, Grays Harbor and Chehalis River improvements to navigation environmental studies - Grays Harbor ocean disposal study: literature review and preliminary benthic sampling: U. S. Army Corps of Engineers Internal Report. Snavley, P.D., and Wells, R.E., 1996, Cenozoic evolution of the continental margin of Oregon and Washington, in Rogers, A.M., Walsh, T.J., Kickelman, W.J., and Priest, G.R., eds., Assessing earthquake hazards and reducing risk in the Pacific Northwest: U.S. Geological Survey Professional Paper 1560, p. 161-182. Sternberg, R. W., 1986, Transport and accumulation of river-derived sediment on the Washington continental shelf, USA: Journal of the Geological Society of London, v. 143, p. 945-956. Twichell, D.C., Cross, V.A., and Parolski K.F., 1999, Evolution of the SW Washington inner shelf since the last lowstand of sealevel, in Gelfenbaum, G., Kaminsky, G.M, eds., Southwest Washington Coastal Erosion Workshop Report 1998: U.S. Geological Survey Open-File Report 99-524, p. 24-28. Venkatarathnam, K., and McManus, D.A., 1973, Origin and distribution of sands and gravels on the northern continental shelf off Washington: Journal of Sedimentary Petrology, v. 43, p. 799-811. Wagner, H.C., Batatian, L.D., Lambert, T.M., and Tomson, J.H., 1986, Preliminary geologic framework studies showing bathymetry, locations of geophysical tracklines and exploratory wells, sea floor geology and deeper geologic structures, magnetic contours, and inferred thickness of Tertiary rocks on the continental slope off southwestern Washington between latitudes 46 N and 48.5 N and from the Washington coast to 125.33W: Washington Department of Natural Resources Open-File Report 86-1, scale 1:250,000. Walker, G.W., and McLeod, N.S., 1991, Geologic map of Oregon: U.S. Geological Survey, scale 1:500,000, 2 sheets. Wentworth, C.K., 1929, Method of computing mechanical composition types in sediments: Geological Society of America Bulletin, v. 40, p. 771-790. White, S.M., 1967, The mineralogy and geochemistry of sediments on the continental shelf off the Washington-Oregon coast: Ph.D. Thesis, University of Washington, Seattle, WA., 213 pp. Wolf, S.C., Hamer, M.R., and McCrory, P.A., 1997, Quaternary geologic investigations of the continental shelf offshore southern Washington and northern Oregon: U.S. Geological Survey Open-File Report 97-677, scale 1:500,000, 4 plates.